Will you run for fun? 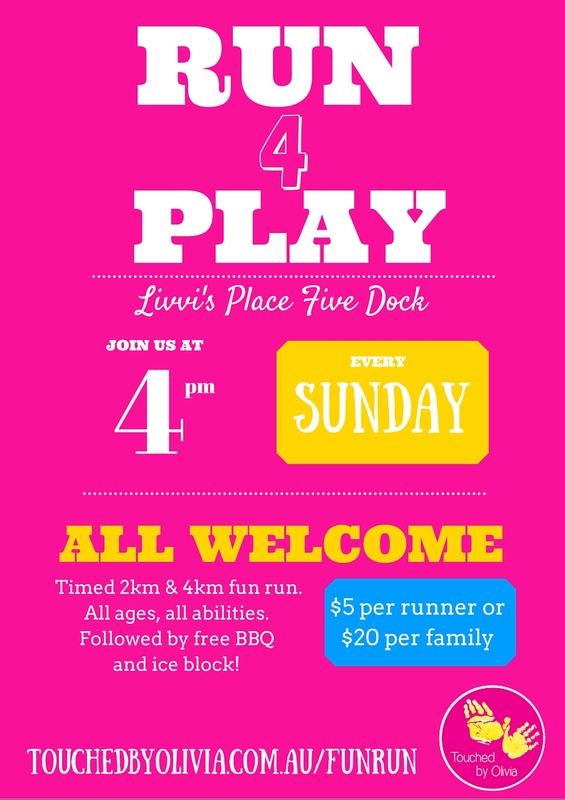 Touched by Olivia is hosting a ‘Family Fun Run’ at Livvi’s Place, Five Dock, every Sunday, commencing on the 24th April at 4pm. This is a timed 2km and 4km run for all ages and all abilities, followed by a free BBQ and ice block. The cost is $5 per runner or $20 per family. Local primary schools around Sydney are participating the Handball Championships through November and December in celebration of i-day. The Big Bands Play Date will feature 4 of Ballarat’s Brass and Concert bands playing family favourites from stage and screen including music from How to Train Your Dragon, The Smurfs, The Lion King, Frozen, Pirates of the Caribbean, Mary Poppins, and many, many more. Fresh from their successes at The Royal South Street and Maryborough Bands competitions, Creswick Brass, Haddon Concert Band, Ballarat Brass and Ballarat Memorial Concert Band are looking forward to showing the next generation of players how much fun music can be! There will be chances for kids to see some of the instruments up close, show off their dancing skills (get practicing for YMCA!) and some will even get a chance to conduct! There will also be raffles (amazing prizes! ), lucky dip, a toddler play corner (thanks to Ballarat Toy Library) and face painting. A kiosk will operate offering yummy cakes, slices and drinks too. The Big Bands Play Date is from1.30pm- 4pm at the Cooinda Hall, opposite Central Highlands Water on Learmonth Rd. Tickets are $5 per person or $20 family and are available at the door. Every cent raised will go towards funding accessible play equipment for Livvi’s Place Ballarat, an inclusive play space to be built in Victoria Park and opening in 2015. This play space is designed so that children or carers with disabilities can play along-side their non-disabled children, grandchildren or peers. There will be a display of the concept plans for the play space at the Big Bands Play Date so people can come along and learn all about it. For more info or to support this journey visit our Friends of group on Facebook. We’ve been recognised by Commonwealth Bank with a community grant to build a prototype CAN chat/ communication board for Pia’s Place #CBACommGrant. So come and help us celebrate the presentation of a $10,000 cheque with a family fun day at Whiteman Park. Nature Play Solutions will be providing loose materials to play with. 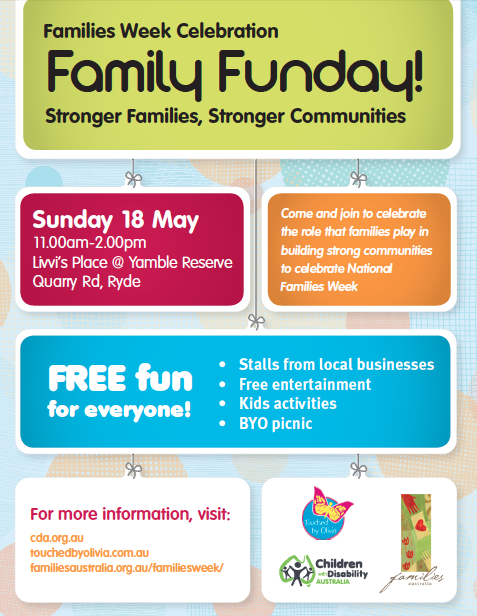 There will be a sausage sizzle, face paints and more…. August 8th at 7.30pm in the function room at Jackson&Co, Ballarat. All proceeds will go directly to funding accessible play equipment for Livvi’s Place Ballarat. In some ways it will resemble a traditional trivia night with tables working as teams, silent auctions, etc. However, this will be a trivia night with a touch of class. Guests will receive a glass of wine and canapés on arrival. Once seated, they will compete in four rounds of trivia: Wine, Music, Food and General Knowledge. All questions will be appropriately “high-brow” (ie. no Kardashians or actors from “Neighbours” allowed). These questions will test your senses of taste, scent, sight, and hearing in a true gourmet themed experience. Platters of finger food will be provided for each table. Will your team have what it takes to be crowned the kings and queens of gourmet trivia? 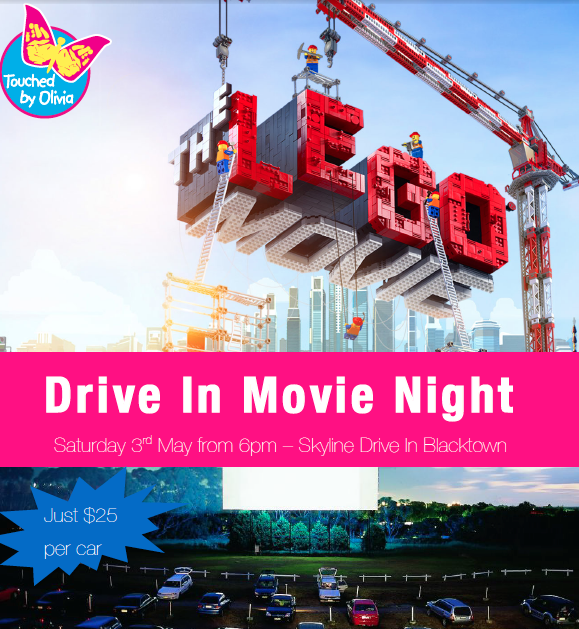 There are still lots of tickets available to Come Play With Us at a very special screening of The Lego Movie – help us to raise funds & awareness for our first inclusive playspace in Western Sydney – Livvi’s Place Jordan Springs. Lego Builders: Bring your own creative creation or make one on the night! Win a Lego Movie Lego Set. PJ Parade: Get rugged up and rock your pyjamas for a chance to win a $100 Stockland voucher! $5 combo deals available for pre purchase with tickets. 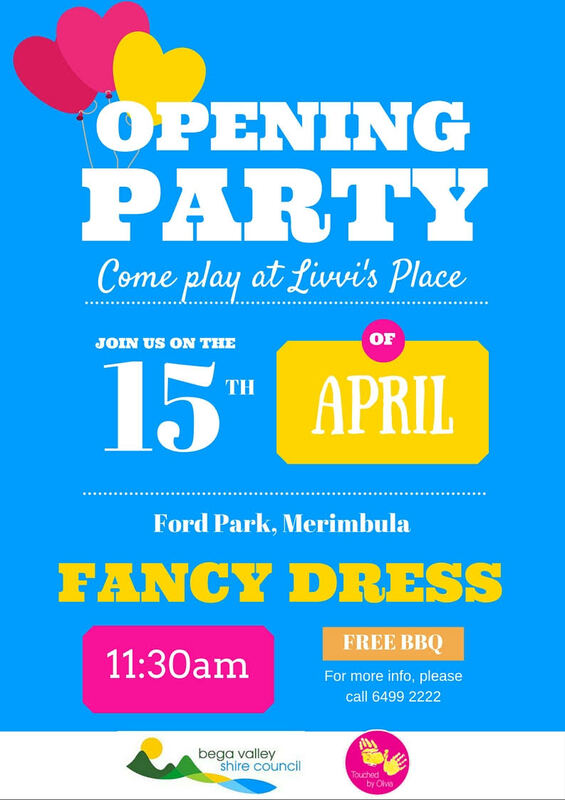 You are invited to celebrate the opening of the first Victorian playspace in the Livvi’s Place National Network. We are very proud to share this special day with you, the realisation of over 2 years of dreaming and planning to create a special place where all of the community can reconnect, play and enjoy the space equally, regardless of differences. This project is a result of a collaboration with Brimbank City Council, and is supported by major partners Leighton Contractors and Commonwealth Bank. The opening will be a fun filled event with music, balloons, face painting, a free BBQ for the whole community and the Commonwealth Bank Treasure Hunt with prizes for the first 100 people to complete the challenge! Join us for a morning tea to celebrate play in the community. There’ll be yummy things to eat and playful things to do. We’re lucky to also be featuring a special performance from our ambassador, Jay Laga’aia, who will play his new song “Livvi’s Place” for the very first time. To assist us with catering, emailrebecca.ho@touchedbyolivia.com.au if you are able to join us. The Touched by Olivia Foundation has teamed up with with Wollongong City Council in order to bring the first Inclusive Playground to the Illawarra. This playground, to be built at Corrimal Memorial Park, will be a place for ALL of our children, regardless of ability, to play alongside one another safely. Our children will swing, spin, slide, laugh, breathe the fresh air and soak up the sunshine in a playground that will look to most, like any other playground. There will however, be some subtle differences that our children with special needs, their parents and carers, will enjoy immediately. We need your help to bring this playground to life! Wollongong City Council has generously committed $125,000 to help fund this exciting project. We need to raise at least an additional $125,000. On the evening of Saturday, 16 March 2013, we will come together in back tie at the Novotel Wollongong Northbeach Grand Ballroom, for an exciting evening hosted by the wonderful Jay Laga’aia. Ticket price includes a three course meal and beverage package, and a host of wonderful local acts, one of which has, and will continue to enjoy international success. There will be lucky door prizes, and a silent auction will run throughout the night. Pull family and friends together to make a table of 10, and enjoy a 10% discount, or contact illawarra@touchedbyolivia.com.au to enquire about our corporate table packages, or sponsorship packages. We can’t wait to see you there! Email Jade at illawarra@touchedbyolivia.com.au to purchase tickets, and help us to give our children with special needs, their parents and carers, a safe and inclusive place to play. ‘Livvi’s Place at Yamble Reserve’ is an all-inclusive playground for children of all abilities to play, learn and socialise together. This inspiring project has been a year in the planning and shows that great things can be achieved when the whole community pulls together to work for a common cause. Join us to celebrate the opening of Livvi’s Place. The big day has arrived, and our fifth Livvi’s Place is opening with a massive party tomorrow – Sunday 2 February. Get down to Yamble Reserve, on Quarry Road at Ryde and be one of the first to play on Australia’s newest inclusive play space, spread over an acre and costing $1.5 million. 10.20 Official opening ceremony with Ministers Andrew Constance and Victor Dominello, City of Ryde Mayor and General Manager, TBO founders and all round awesome people John and Justine Perkins and Danny Dickson from Children with Disability Australia. 11.45 Jay Laga’aia performs. Our favourite performer will get the toes tapping and the smiles spreading with his tunes. 12.45 Be amazed by Harry Mak, magician and puppet man! We’ve organised face painting, sausage sizzles, coffee and ice cream for sale. There is accessible parking available in Clermont Ave, and some parking in Quarry Road car park. Touched by Olivia Foundation has run on the physical and financial support of you, our friends and network. While we are up to our elbows in wrapping paper and packing for holidays, it’s time to send you some gratitude and reflect on how your support has helped make our dreams for 2011 come true. Since inception, we’ve had two goals to increase the health and happiness of children 1) to improve the awareness and support of people suffering from vascular disease, in particular lymphatic malformations and 2) to ensure there was an inclusive playground in reach of every community in need. We’d worked out that there were 42 locations across the nation, and set about a 10 year plan to make this happen. 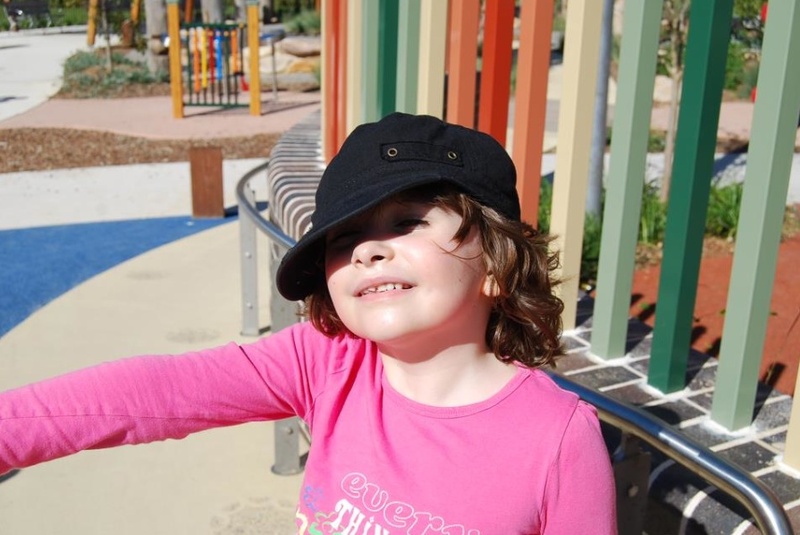 Early 2011, this strategy really kicked into gear as we added to our play ground network numbers 3 and 4 – Livvi’s Place Dubbo and Livvi’s Place Hawthorne Park. There’s a stack of new sites under development across Australia in partnership with governments, businesses and communities including Livvi’s Place Ryde, NSW, Pia’s Playground, Whiteman Park, WA, Penrith, NSW, Jindabyne, NSW, and St Albans, VIC all scheduled for 2012, plus a host of other locations in various stages. Every project has a dedicated community driver who’d love your support. If you can volunteer your skills and time, or if you are a business who’d like to sponsor a piece of play equipment or contribute in any way, we’d love to hear from you. Pleasedrop us a line to make a huge difference to the kids of Australia for many generations. While there were many highlights of the conference, the stand out was watching hundreds of international delegates watching our presentation with huge smiles on their faces. A few days later, we headed to Parliament House in Canberra as a nominee for the National Disability Awards for our contribution to creating inclusive and accessible communities. An inspiring ceremony, we returned super charged to ensure our next event (the national event for International Day of People with Disabilty in partnership with Children with Disability Australia) delivered. And it did. The unpredictable Sydney weather held for us, as the sun shone all day long over our flagship playground Livvi’s Place Five Dock. Families enjoyed the fun and free activities and amusements, and we welcomed Senator Jan McLucas, who shared with us the announcement that Touched by Olivia Foundation had been granted funds to host a national inclusive play consultation. The dream of an all abilities playground within reach of every family in need is closer to reality. Continuing our fantastic fundraising efforts over the last 4 years, this May we hosted our fifth Butterfly Ball to support strategy 1. In true Touched by Olivia style, our guests embraced the Viva Las Vegas theme, enjoying performances from Tom Jones, Elvis himself and showgirls as well as our wonderful ambassador and MC, Jay Laga’aia. Thanks to our guests and generous sponsors we were able to raise $185,000 for the Touched by Olivia Vascular Birthmarks Fellowship at Sydney Children’s Hospital to continue their ground breaking research. In total, we have raised almost $1 million for the Sydney Children’s Hospital, helping position it as one of the leading facilitors of research into vascular disease. They have produced a number of medical publications, a clincal trial with fantastic results and allowed us to network with families from all over the world with kids who suffer from this family of diseases. Day by day we are moving closer to understanding the disease more and will continue to our efforts to one day find a cure. (P.S. Don’t forget to try to spot yourself on Planet Cake – Lifestyle Food this Wednesday evening). It’s been a full and productive year made possible thanks to you. The efforts of our amazing team of dedicated volunteers were recognised at the NSW Volunteer Team of the Year awards earlier this month at NSW Parliament House and we couldn’t be prouder of you all. The TBO family is a generous spirited, playful and positive group of talented and passionate individuals who embody the saying “be the change that you want to see in the world”. We look forward to continuing to share the journey with you in 2012. Until then, may the force be with you and yours this holiday period.